Great sound even in noisy surroundings. 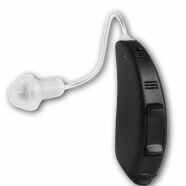 Interton’s innovative technologies make hearing in everyday situations so much easier. Crisp brings back lost high frequencies and filters out background noise. It restores speech clarity, while maintaining a relaxed, natural sound, so you can follow a conversation even in noisy places like restaurants or airports. SoundScape technology brings back the natural sound experience. It mimics the organic sound processing of the human ear to produce sounds that are as rich, clear and natural as they can be. That means you hear everything that’s going on around you, and can locate where sounds are coming from. Our Feedback Management System also eliminates disturbing whistling sounds when you put things close to your ears or hug your loved ones.